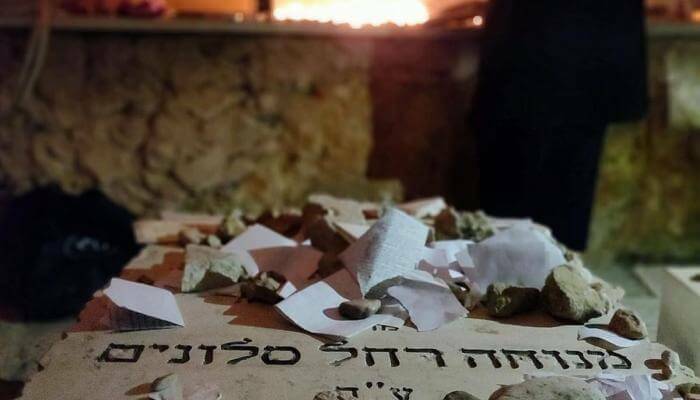 PHOTO: Notes placed on the grave of Menucha Rochel Slonim in Hebron on her yahrzeit. Credit: Elimelech Karzen. Rebbetzin Menucha Rochel, the daughter of the Mittler Rebbe of Lubavitch, was born on the day her grandfather – Rabbi Shneur Zalman of Liadi, the “Alter Rebbe” – was released from prison in Russia. Her grandfather added “Rachel” as her middle name after his daughter who had died recently. Menucha Rochel married Rabbi Yaakov Koli Slonim and together they raised a family in the town of Lubavitch. In 1815, her father the Rebbe sent shluchim, or emissary groups to strengthen the small, but ancient Jewish community in Hebron. He initiated the purchase of plots of land in the city and even purchased the “small synagogue” next to the Avraham Avinu Synagogue. This synagogue, which was ransacked in the 1929 massacre and later by the Jordanians, was restored and renovated and today is active. After her father’s death, her brother-in-law, the Tzemach Tzedek, took over the leadership of Chabad. Upon his advice, Rebbetzin Slonim immigrated to the city with her family in 1845. Even if we subtract the percentages required from the dramatic description, we find that the topographic description is not suitable for the location of this house. It turns out that the Rebbetzin’s home was located in what is now known as the main street of the Casbah, a street where there are quite a few appropriated Jewish properties. Researchers identify the house in question in a structure known as the “House of the Haref”, near the “courtyard of the Kabbalists” in the heart of what is today a bustling Arab marketplace. Israeli access to the area is very limited.